Preheat oven to 350*F. Prepare 3 layered cake pans, 10" tube pan, or 2 loaf pans. In small bowl, combine buttermilk and lime juice, set aside. Cream butter and sugar until fluffy. Add in eggs one at a time, beating well to fully combine. Combine flour, salt, baking soda and powder in separate bowl, stir to combine. Add flour and buttermilk mixtures to butter mixture, alternating, starting and ending with flour. Do not overmix. Add in food coloring (to desired darkness), stir just to combine. Spoon batter into prepared pan(s). Bake for 30 - 35 minutes (layered), 50-60 minutes (pound), testing with a toothpick for doneness. Remove from oven and let rest in pans for 15 minutes before inverting onto cooling rack to cool completely. Beat first 4 ingredients at medium speed with an electric mixer until creamy. 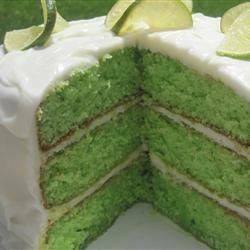 Gradually add powdered sugar alternately with key lime juice, 1 tablespoon at a time, and 1 tablespoon milk, beating at low speed until blended and smooth after each addition. Beat in up to 1 tablespoon additional milk for desired consistency. Garnish with key lime slices and kiwi slices.